I went to this charity event the the other week. It was fun to see Stephen King read the original story that was told by the Storyteller in Stand By Me and he says, "It's the R Rated version." John Irving read a christmas tale, and JK Rowling, she read from the latest book. After the readings they took 12 questions answered by the authors. People seem to ask Stephen King, "What scares you?" all the time and they wasted this opporutnity to ask him it yet again. 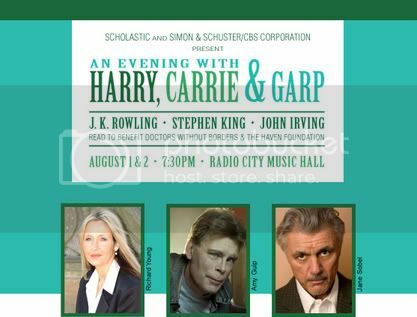 New York, NY – August 9th, 2006 -- For those book lovers and fans world-wide who could not attend the star-studded literary event at Radio City Music Hall last week, “AN EVENING WITH HARRY, CARRIE & GARP” will now be available to watch free of charge in its entirety for two days only. On Thursday, August 10 and Friday, August 11 MSN will stream the event at http://video.msn.com, and beginning on Saturday, August 12 until the end of the month, highlights will be available on demand. MSN will enable viewers to make contributions to The Haven Foundation and Doctors Without Borders. I watched this last night! You are right, it is totally awesome! Hey, What Happened to the Color?